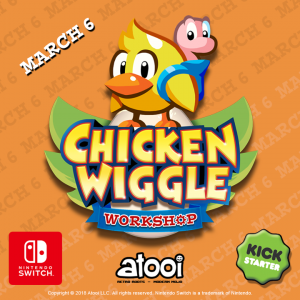 Atooi’s Kickstarter Page for Chicken Wiggle Workshop Has Gone Live! Chicken Wiggle Workshop takes all of the eggsellent content from the original Nintendo 3DS game and brings it to Nintendo Switch with beautiful new HD artwork. Many Chicken Wiggle fans have told us, “We want Chicken Wiggle on Nintendo Switch!” And, we would love to make that happen for you! Please help us hatch this awesome platforming game / level maker on Nintendo Switch with beautiful new HD artwork.